We are counted amongst the eminent names in industry, engaged in supplying. For the comforts of the patients, we have designed these items in such a manner that they can be easily adjusted as per the requirements. Clients can avail our products in different sizes, designs and models according to their specific needs. Our range is supplied in different clinics and hospitals. We manufacture deluxe model hand driven tricycle for facilitating easy movement of handicap people from one place to another. These tricycles are specially designed for easy maneuvering. Frame Made by ISI Marked E.R.W. Tubes 38.0 mm-16 G.
With our excellent technical team, we are known as an efficient names occupied in offering of Designer Handicap Tricycle. We are providing this handicap tricycle to our widespread clients at a competitive price. 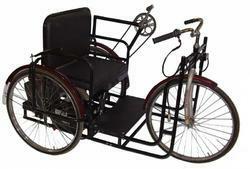 Easy and reliable to use fully metal huge basic tricycle for physically challenged peoples. • Three wheel's with good rubber polymers tires. • Both the side hand driven facilities are avaiable. • Comfortable seat rest and back rest with cushion. We manufacture Deluxe model hand driven tricycle for facilitating easy movement of handicap people from one place to another. Hand mover tricycle for physically handicapped person cusion seat.